I’m sure you’ve heard of Customer Lifetime Value (CLV). It’s a fascinating metric used to calculate how much your business can potentially make over the lifetime of your customers. It’s also sorely underutilized, especially when it comes to marketing. But before I get into that, here’s a quick index if you feel like jumping around. Why should you care about CLV in your marketing plan? In essence, the more you increase your CLV through your marketing, the less you spend acquiring new customers and the more money you make. That’s exactly why you should care about CLV marketing. Your marketing efforts should focus more on retaining and growing your current customer base, as opposed to acquiring new customers. First, you must calculate your business’s CLV. As you can see, CLV is calculated by taking three simple stats across a few customers and plugging them into an equation. Now you understand why CLV is important and how to calculate it for your business. That’s great, but it does nothing for you without putting those insights into action! Thus begins the fun part. Before you can begin using the CLV to your advantage, you have to figure out which of your customers are the most valuable. In order to do that, you need to segment your customers into different “buckets” based on past sales. This part isn’t too difficult. It’s simply a matter of diving into your sales data and picking out your top customers. Your buckets could be based on how much your customers spend or how often they order. Of course, these buckets should work to your sales – it could be $10-$50, $50-$100, etc. Once you’ve segmented your customers, it’s time to determine how you can get more from your best customers, and get your good customers to become your best customers. He means that you shouldn’t be focusing on advertisements trying to interrupt people to get them to pay attention to you. Instead, you should focus your marketing dollars on engaging the people who are already interested in you, such as your email subscribers, social media followers, and past customers. Loyalty programs are an excellent CLV marketing strategy. They can entice current customers to return and spend more – thus increasing their lifetime value. What makes customer loyalty programs so powerful is their ability to use a combination of gamification (adding game elements to your store to make it more rewarding) and emotional connection to build brand advocates who not only have a high CLV but also increase your CLV of other customers through their recommendations and endorsements. A great example of using a loyalty program to increase CLV would be hooking them on earning points. Customers can earn points from purchases, but you can also give them other ways to earn points like leaving reviews or inviting friends. Once you get your best customers hooked on the idea of earning points, they’ll be more likely to return to spend more and bring other loyal customers to your store. Push notifications are something previously only used by email and messaging services. Then social media caught on, and now eCommerce stores and other types of businesses are cashing in. Here’s the magic: If you can get your visitors to allow push notifications, there’s a good chance they’re beginning to connect with your brand on a deeper level. I personally only allow push notifications from websites I deem a top priority, and I’m sure I’m not alone in that regard. You can use push notifications to showcase your latest deals or induce flash sales which take advantage of the scarcity mindset. According to Dr. Robert Cialdini (@RobertCialdini), author of Influence: The Psychology of Persuasion, we are more motivated by the idea of potential loss than of potential gain. For example, LoungeBuddy, an app that connects people to airport lounges, used push notifications and scarcity to stir people to take action and sign up for their sweepstakes. If you’re getting excited about using push notifications for your store, KISSmetrics (@KISSmetrics) has a very in-depth guide to using push notifications for eCommerce. Staying true to the idea of push notifications, SMS messages can be a great boon to your store. In contrast to email and social media, which can take hours or days to be looked at, 90% of SMS messages are typically read within the first three minutes of being received. That’s powerful. What makes SMS so useful is that, similar to loyalty programs and push notifications, it further ingrains your customer into your brand. The more things you can do to get your best customers to love and connect with you, the higher their CLV will grow. In addition, SMS can help you find out who your best customers are. The people who engage with your texts are the ones you should focus on making feel special and appreciated. Here’s an awesome example of SMS done right. If you can get your customers to engage with you like that, you’re on your way to something big. CLV marketing is all about growing your best customers to the most they can be; what better way to do that than by engaging with them like a friend? If you’re ready to delve into the world of text marketing, SimpleText (@SimpleTexting) has a nice guide to SMS marketing for eCommerce. Developing a mobile app for your store is a great way to lead customers into saying yes to push notifications and receiving texts from you. It’s also a great way to get them to engage more with your loyalty program, as an app can make it easy for them to see and use their points. It’s true – mobile accounts for a third of all eCommerce transactions at a whopping $104 billion annually. And it’s growing more than 30% every year. If you’re ready to develop a mobile app for your business, JackRabbit Mobile (@TeamJackRabbit) also has a great guide to eCommerce mobile app development. Ahh, good ole’ social media. Everyone knows it’s important, yet few succeed at it. Calvin Wayman (@CalvinWayman), the founder of CobbesMedia and author of the book Fish Out of Water, told me the secret to social media is the four C’s: Content, Context, Consistency, and Connection. Most businesses simply post about their business, and expect everyone to listen, even though they’re not engaging with others or giving before they try to take. Investing in your social media strategy means investing time and/or money in connecting with the people you can help, and truly caring about building those relationships. The only way to get it right is to figure out what you or your brand stands for, then using those values to connect with like-minded people. One example of social done right is Nike Women’s Motivation Pinterest board. The reason this board works so well for them is that it allows their customers to connect to something bigger than themselves. Their customers aren’t just buying into Nike – they’re buying into fitness, motivation, and hard work. People share things on social media to show off their unique identity and personality. If you can relate your brand to a certain type of personality, you can capitalize on this. Check out Shopify’s article about 10 inspiring eCommerce examples of social media done right for more inspiration. UGC is one of the best ways to increase your CLV. Staying true to this idea that a deeper connection with a brand will increase the money a customer spends over their lifetime, UGC is an excellent strategy to attain that deeper connection. Think about it – when a person shares a picture of their new shirt from your company on Instagram or some other social platform and you engage with them, don’t you think it will make them feel special? One of the basic needs every person has is the need to feel special. Coca-Cola did it extremely well with their named bottles. If you don’t currently have UGC, there are ways to encourage your customers to post photos about your brand. 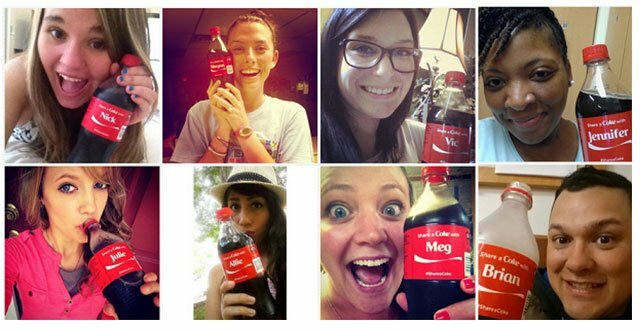 If you do have UGC, but don’t know what to do with it, there are ways to start monetizing it! Popups have been around a long time. They’re actually now called “Lightbox Overlays” because they’re not technically popping up in a separate window anymore. Despite the fancy name, the idea is still the same: Show your visitors an offer in the hopes they will sign up for your newsletter or email list. Why would you want to use popups, though? I mean, people find them annoying, right? Maybe, but they still work. In one test, popups drove 1,375% more email captures vs. a sidebar opt-in form. Groupon uses a unique popup design. They actually segment their customers using an interactive popup quiz, which allows them to better understand their subscribers. If you run a fun eCommerce store, you can use this to your advantage by including your own fun pop up around something like your user’s favorite kind of dog (if you’re a pet supplier) or your user’s ideal outfit (if you sell clothes). 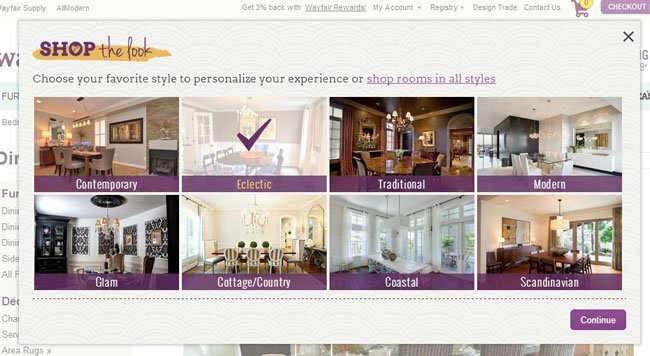 Similar to Groupon, Wayfair uses an interactive popup to help engage and segment their customers. If you’re looking for some help figuring out which popup might be right for you, WishPond (@WishPond), a popup solution, has an awesome article about the 7 habits of effective popups. Retargeting is a marketing tactic where you display products to people who visited your eCommerce store but didn’t buy. For example, say you have a customer who was looking at a shirt on your website but didn’t buy. Retargeting allows you to show that shirt to them again on social media and in search engines. What’s really amazing is that people who are shown retargeting ads are three times more likely to click on your ad than someone who hasn’t interacted with your business! Retargeting is also fairly easy to set up. HubSpot (@HubSpot) has a great article to get you started on retargeting. Retargeting can be used in CLV marketing as a way to get your high spenders to keep coming back. The more you engage them, the more they’re likely to buy. Email is my all-time favorite tool in my CLV marketing toolbelt. Wanna know why? Email marketing averages an ROI of $38 for every $1 spent. Here’s the thing – general email broadcasts/updates typically don’t work. Emails that are relevant to the recipient drive 18 times more revenue than general broadcast emails. The best part of investing in an email strategy for CLV marketing is that past customers are more likely to buy from you again through your emails. Notice they’re hilarious copy and even great use of image alt text. If you’re ready to up your email marketing game, KISSmetrics has a great beginner’s guide. Customer lifetime value is an important metric to look at when considering where to invest your marketing dollars. It’s easier to invest in the people who are already buying from you than to get strangers to notice you – and more rewarding, too. Once you’ve calculated your CLV using the formulas provided above, figure out those key customers worth their weight in gold and go after them relentlessly. Don’t drive them away, of course – just treat them extra nice. What methods have you used to make your good customers even better? I’d love to hear about them in the comments!